From Kendall Jenner’s noticeable absence on the catwalk to Nicki Minaj and Cardi B’s fight that blew up social media, New York Fashion Week (NYFW) 2018 has received an abundance of press since it kicked off September 6. The week began with 90+ degree temperatures, then devolved into a steady, chilly drizzle. 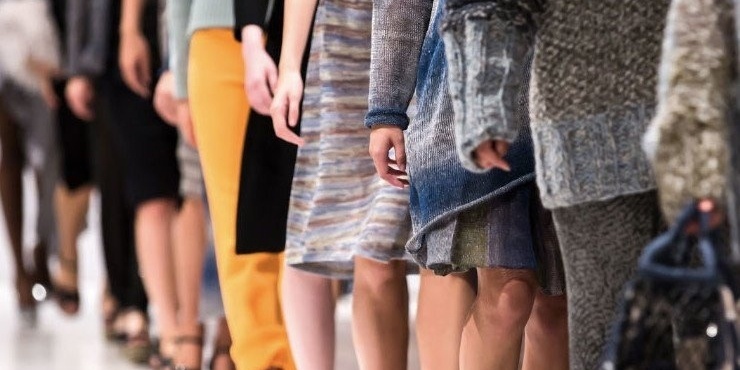 Once inside and out of the elements, influencers, celebrities, and fashion’s elite were greeted by bright florals, warm pastels, and bold patterns as designers showcased their spring 2019 and ready-to-wear collections in venues throughout the city. Today, event professionals behind some of the biggest fashion houses have turned what was once a simple formula (30 minutes of seating, 10 minutes of show) upside down. Today, NYFW isn’t just a temporary event, it’s a cultural conversation. This shift is due in part to see-now-buy-now offerings. The opportunity to turn a presentation into an interactive retail opportunity has forced designers to think outside the box and create experiences that spark curiosity and on-the-ground engagement. Know the difference between fashionably late and disrespectfully late: An infamously on time designer was scheduled to show his spring 2019 collection at 6pm on Wednesday evening. The show was running over an hour late, with no explanation other than the sight of sewing machines being rushed backstage. Eventually, certain editors with flights to catch had to leave and then, at approximately 7:25 pm, those remaining took their seats and the lights went down to start the show. We’re all for allowing a 5-10 minute delay to accommodate traffic and unforeseen issues, but when the guest experience is put on hold, it doesn’t matter how wonderful the event is, all they will remember is being left waiting. Immerse guests in the experience of your event: Pyer Moss designer Kerby Jean-Raymond brought the fashion set to Brooklyn’s Weeksville neighborhood for a show that was just as impactful as its location. Weeksville, one of the country’s first free black communities, was founded by African-American James Weeks in 1838, just 11 years after slavery was abolished in New York. There, Jean-Raymond set his runway outside, just beyond a group of the original white-frame houses in the community center, where a 40-person gospel choir sang throughout the show. By taking your guests out of their comfort zones, safely and with care of course, your event can extend its emotional impact well beyond a tent or traditional venue. Let them eat cake! : Another show featured a unique runway setup. Instead of a proper front row, VIP guests were seated at round tables adorned with confections and macaroons from famous bakery, Ladurée. The treats and table cloths matching the designer’s signature, soft pink aesthetic. However, no one dared take a bite of anything, for fear that they were not for consumption, but merely decoration and guests were overheard wondering whether they were allowed to indulge or not. Decorating with food can create an elevated and unique look to your event. Though we’ve all seen a guest trying to eat a garnish. Remember, nothing makes people hungrier than being surrounded by food they can’t eat, so counterbalance the decor with passed trays and smile bites. Tease event details, but save the most jaw dropping elements for the big reveal: Calvin Klein immersed his guests into a very familiar Cap Cod town. Guest Leandra Medine describes the tone, “The opening scene — a five-piece series of scuba suits folded down to mini dresses and pants and one errant graduation cap — walked against another scene, this one from the 1975 classic, Jaws, projected against the walls of the venue. Without familiarity of the movie (and the theme music that opened the show), you might not recognize this as the last time we’d see Chrissie Watkins, skinny dipping into the ocean while at a party in New England. It could instead look like the stunning end to a breathtakingly lazy, almost fantastical summer night.”There are so few true surprises left in this world, so make sure your event delivers on a selection of special ones. Of course, communicate as much as you can with guests pre-event to induce interest and excitement, but give them something extra onsite.